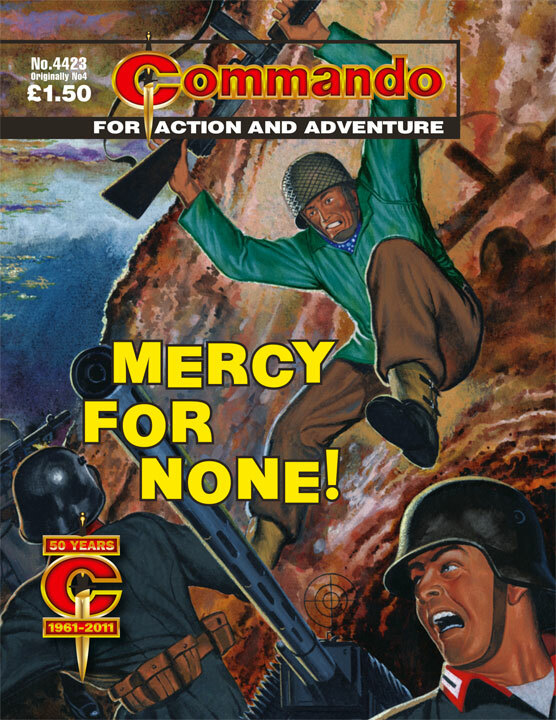 More on Commando celebrations from Commando HQ as an exhibition of Commando artwork under the title Draw Your Weapons is launched at the National Army Museum in Chelsea, London. Sitting tensely together in the Dakota on their way to the night drop into Occupied Europe, ten hand-picked paratroopers jokingly nicknamed themselves the ten little soldier boys. 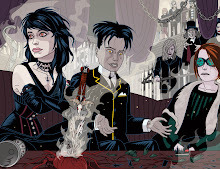 Fate must have smiled, for it turned out to be a grim and deadly jest. They say that gallows humour is the darkest of all. And this story has the blackest stripe of that type of humour running right through it. 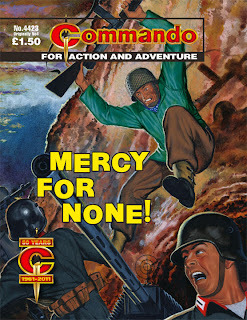 As the paras at the centre of the action begin to meet their fates, one of their numbers starts to recite a macabre rhyme which can have only one fatal ending. Artist Gordon Livingstone, in one of his earliest outings for Commando, enhances the darkness of the tale with generous use of black ink while cover artist Ken Barr leaves you in no doubt that there’s plenty of action waiting inside. 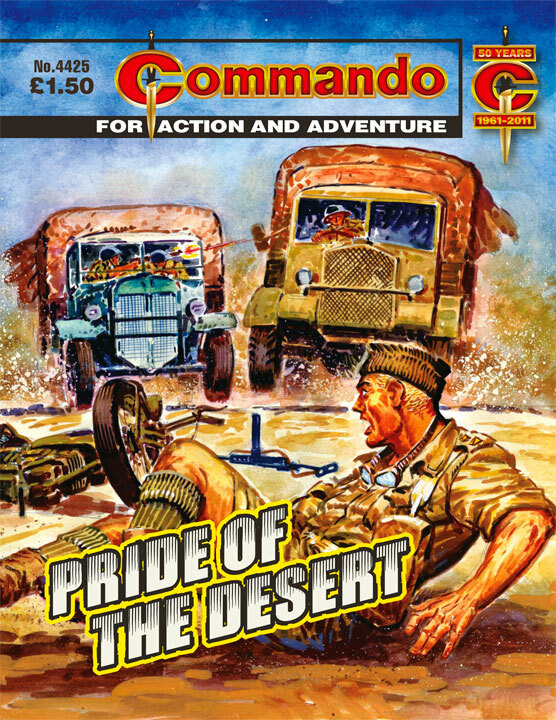 Classic Commando — you can see, and read, why they were such a runaway hit from Day One. Flat on his stomach on the railway line, Private Andy Morgan crawled forward grimly. It was up to him to stop a Nazi armoured train — and all he had to do it with was one single hand-grenade. And what made it even tougher for Andy was that the only two guys with him were the type who would pack up and run if things got dicey. In this brilliant tale we meet a couple of ne’er’do’wells who seem to positively revel in their bad attitude and lack of discipline. 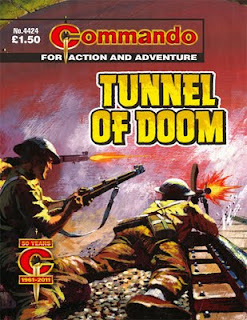 The aptly named Dodger Harland and Scrounger Dunville are classic Commando characters and it’s not long before they’ve had a bad influence over Andy Morgan, our fledgling hero. 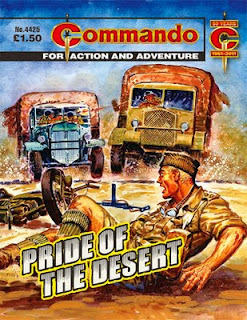 However, when push comes to shove, perhaps these two aren’t quite what they seem…Redemption is a common Commando theme and this cracking story, with its gritty interior art and a superbly painted cover by Penalva, has an eerily original spin on it. What do you get if you send a marauding, aristocratic “Toffs Brigade” on a race against time to recover their stolen regimental silver? You get a rip-roaring adventure, that’s what! 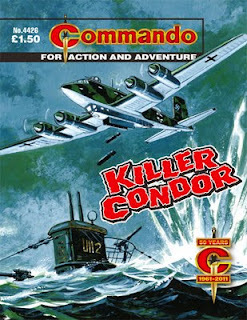 “Relax, it’s one of ours.” So said the U-boat’s look out as the looming shape of a Focke-Wulf Condor appeared over them. Unfortunately the crew of the bomber didn’t seem to realise that the sub was on their side for its lethal payload was soon tumbling down to bring destruction and death to the men below.